How Fast is China's Economy Really Growing? China’s Central Bank Governor said Chinese economy growth will hit 7 percent in H2. The third quarter data on China’s economic growth, released by China’s National Bureau of Statistics (NBS) on October 19, showed that China’s GDP grew at 6.8 percent. Although the growing pace was 0.1 percent slower than that in the second quarter, it still met the Chinese government’s expectations. China has set its economic growth target of this year at around 6.5 percent. Days earlier, China’s central bank governor had said more optimistically that China’s economy could grow 7 percent in the second half of this year. NBS said in a statement: “In the third quarter, the economy continued to grow at a high rate of 6.7-6.9 percent in nine consecutive quarters.” Specifically, industrial production grew 6.7 percent year over year (YOY) , a 0.7 percent increase compared to last year; and fixed asset investment increased 7.5 percent YOY, 0.7 percent slower than last year. China’s economic development in first three quarters was “steady and moved towards a positive direction,” NBS concluded. Meanwhile, Zhou Xiaochuan, the governor of China’s central bank — the People’s Bank of China (PBOC) — was more optimistic about China’s economy. On October 15, when attending an event of the IMF/World Bank annual meetings in Washington D.C., Zhou talked about China’s economic prospects and forecasted that China’s GDP growth is expected to reach 7 percent in the second half of this year. According to the version posted on the PBOC’s website on October 16, Zhou believed that the momentum of China’s GDP growth has picked up this year. “The driving force is mainly the fast growing household consumption,” Zhou said. It is fair to say that in the stage of urbanization, the fiscal policy transparency is not good enough, the inter-governmental fiscal relationship has yet to be improved, and there is no clear fiscal discipline to constrain the local governments. So in the financial market, there is distortion in the pricing of the local government bonds and the lending to the financing platforms of the local governments. Due to this distortion, the commercial banks and financial sector have underestimated the risks in the fiscal standing of local governments…At the same time, we should note that compared with the private sector debt and external debt, the risks in the government debt are relatively low. 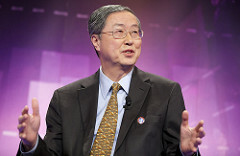 Before his retirement, Zhou Xiaochuan has repeatedly sounded warnings about China’s economy.